Encore Protection offers 24/7 nationwide emergency roadside service, assistance and protection for cars and motorcycles, with a variety of additional benefits, including discounts on travel and shopping. We offer nationwide roadside protection so you’ll never be without help when you need it, enabling you and your family to travel with confidence, knowing that our roadside assistance coverage applies nationwide. Our individual membership is designed to protect the policy holder no matter what car he or she is driving. What’s Included In Our Program? Get expert advice from ASE certified mechanics for a second opinion on repairs and associated costs. Concierge Phone Service—directions to nearest hotel, gas, restaurants, etc. Receive a free Entertainment membership that includes national and local member-only discounts for dining, shopping, entertainment venues and more. Sign up today and see how much you and your family can save each year! For questions about our 24-hour nationwide roadside assistance service, please send us a question and we’ll send you a response as soon as possible. 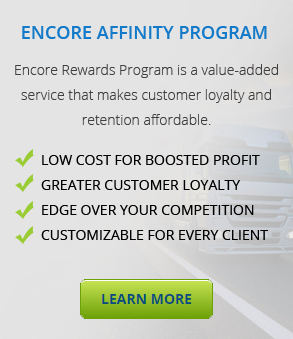 Encore Protection’s 30-day money back guarantee does not include claims, and is prorated from the date of membership cancellation. Please note that if you do file a claim during this period of time, you will be ineligible for a refund. The staff at Car Solutions was wonderful to work with and I am so glad I purchased Encore Protection. They took the stress of being stranded on the side of the road completely away. I called for help and within 15 minutes a friendly tow truck driver arrived, replaced my tire with a spare and then helped guide me back out into the highway. The entire process was very easy and I highly recomend Encore protection. Thank you Car Solutions!